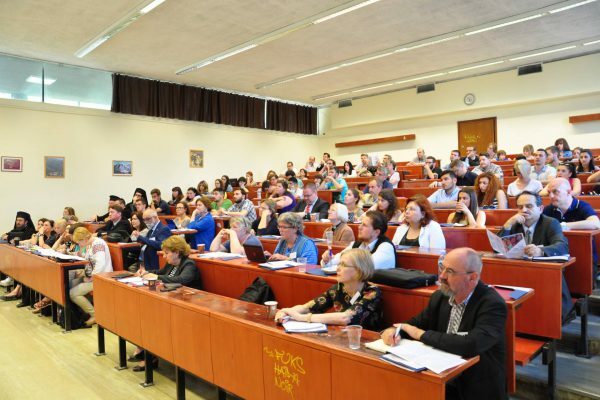 The Conference of European Churches, in partnership with the Theological School of Aristotle University, organised the 3rd Annual Summer School on Human Rights “Stand up for Women’s and Children’s Rights!” from 31 May to 4 June in Thessaloniki. More than 90 people, from different countries and representing a number of denominations, participated in the opening of the Summer School. Speakers included experts from Council of Europe, NATO, European universities and many CEC Member Churches and Organisations in Partnership. The situation of women and children was highlighted and discussed from legal, theological, and practical angles. In many situations, women and children are discriminated or denied their fundamental rights, such as the right to food, shelter, education, access to health care, participation in society and so on. In some European countries one of three women are victim or a potential victim of different forms of violence, including sexual violence and harassment. Children often face various types of violence and abuse on a daily basis, including bullying in schools. With regard to refugee women and children, the situation is direr still. Participants agreed that a common response is needed by states, societies, churches and other religious organizations, as human dignity does not have gender or age. The summer school facilitated the exchange about best practices on how to promote gender equality and the rights of the child in church and society. Summer School participants learned about international, European, and national legal frameworks on the protection of the rights children and women. The United Nation’s Convention on the Right of the Child (CRC) and monitoring systems related to it are especially important for child-centred responses and safeguarding their best interests. Close analysis of biblical passages and traditional teachings of the churches helped shape discussions. There was a call for a self-critical theology that takes children as a starting point and gives them a voice. There were several study trips, including to the Centre for Roma Minors, to the premises to the NGO NAOMI, and to the refugee relocation center Diavata. The students who attended the summer school had also possibility to pass the exam from this subject and receive credit for their studies. For more information on the Summer School programme, please visit the CEC website. The Conference of European Churches (CEC) is a fellowship of some 114 Orthodox, Protestant, Anglican and Old Catholic Churches from all countries of Europe, plus 40 national councils of churches and organisations in partnership. CEC was founded in 1959. It has offices in Brussels and Strasbourg.